I like it. Its peaceful. Nice picture. Don't like the red color, but I think that's the way night photos come out. Great color and contrast to fit the title of this subject. This picture tells me a story. Great imagination on this! A regular horse of Mars would have been better. Too bad they don't like to stand still for photographers. 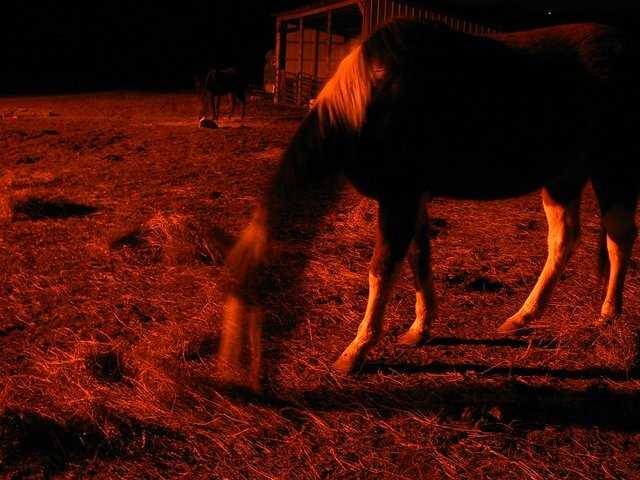 I like the color the the light produces, but the horse moved a little too much. Good title and nice lighting. Orange cast is no good. And I'm not much for blurry images. A more crisp horse's head would've been better. Have you always been able to see through this horse?? I wish we could see more of the structure behind th horse! Does the photographer have camera shake or is the blurred focus due to excessive movement of top part of the subject? I like the red hue very Mars like. Proudly hosted by Sargasso Networks. Current Server Time: 04/18/2019 04:56:01 PM EDT.